Imagine, if you will, that the most important Catholic in the world decided to visit your diocese. How would you plan for such a visit? Where would you hold a Mass for, say, 350,000 people? That was the challenge and the opportunity embraced by Bishop Maurice Dingman when he learned that Pope John Paul II would honor the people of Iowa and the American heartland with a visit Oct. 4, 1979. The story of that historic day — and all the planning that preceded it — is told with verve and clarity in the closing chapter of a new book that will be of interest to Catholics across the country. 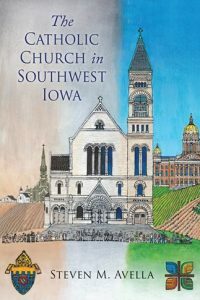 “The Catholic Church in Southwest Iowa,” written by Father Steven Avella, a professor of history at Marquette University, traces the history of the Diocese of Des Moines from its earliest days as a cluster of parishes in Iowa’s capital city to its elevation as a diocese in 1911 and on to the papal visit. The book traces an important and often overlooked story of the trials and triumphs of Catholics on the American prairie. That this book will have an important impact on how we understand the achievement of the church in this country is evident in early reviews. Historians and scholars have reviewed Father Avella’s work and saluted his ability to bring together the story of a diocese of small cities and big towns bound together by hundreds of bustling farms. The book is divided into nine engaging chapters that begin with the frontier days of the church in Iowa and introduce readers to the committed clergy, professed religious and determined laypeople who shaped Des Moines Catholicism until 1911 when southwest Iowa parishes were clustered into a new diocese under Bishop Austin Dowling. Subsequent chapters are organized around the tenures of Bishops Thomas Drumm, Gerald Bergan and Edward Daly and Bishop Dingman. The book concludes with that chapter on the papal visit. “The providence of God is very evident in this knoll and in all of rural America,” noted Bishop Dingman, as the pope arrived by helicopter at Living History Farms, the site of the historic liturgical celebration. It was a day that will live forever in the history of American Catholicism in general and Iowa Catholicism in particular. Walch is a member of St. Thomas More Parish in Coralville, Iowa, and the author of many books on the history of American Catholicism including “Parish School.” He serves on the board of directors of The Catholic Messenger, newspaper of the Diocese of Davenport, Iowa.